I have been wanting to add Lipstick Queen's Aloha to my collection for absolutely agggges, and I finally convinced myself to do it whilst watching one of Estée's YouTube videos. You know one of those occasions where you bargain with yourself - "That looks gorgeous...I swear if that is that lipstick again, I'm getting it right now." Well it was, and low and behold, it went into my basket and promptly arrived through my letterbox last week! 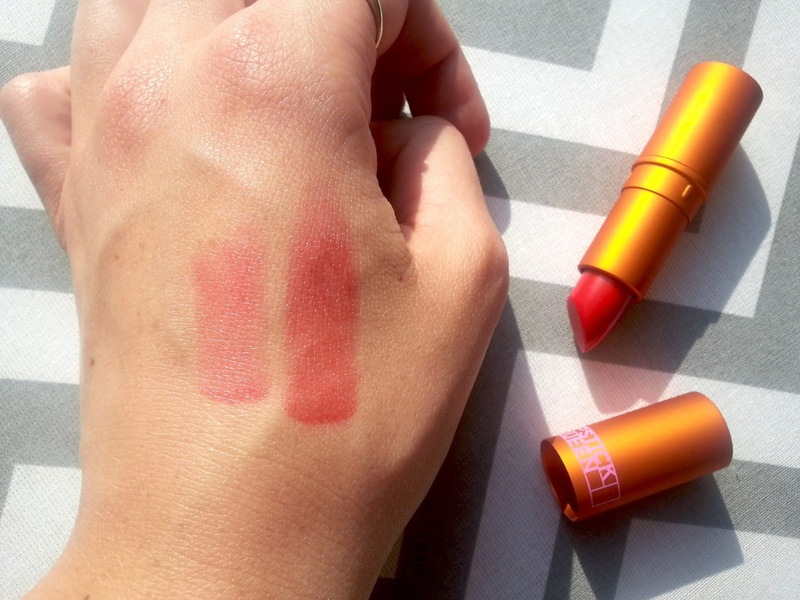 First impressions of the lipstick was that it is a lot smaller packaging wise than other lipsticks that I own. 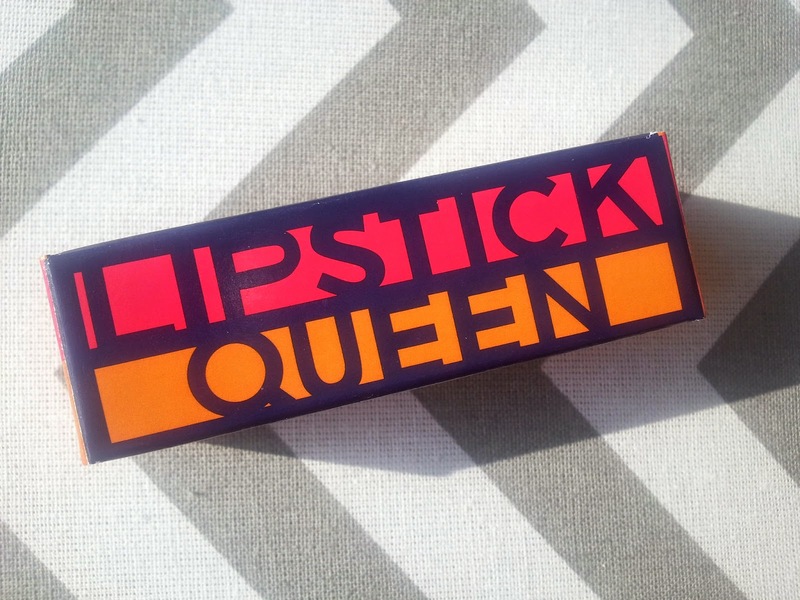 The packaging is gorgeous though; a bright orange, metallic tube with a lilac Lipstick Queen logo. If you're after that satisfying lipstick click, you won't find it here, but you do have to put a tiny bit more force to wedge the cap into place. I also think the packaging is slightly more weighted, so helps give it that higher end feel. 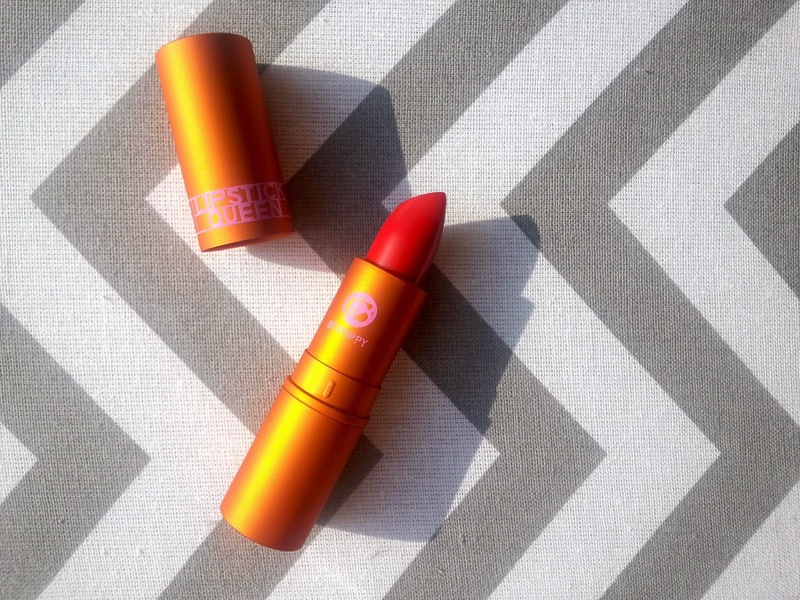 Aloha is part of the Endless Summer collection, and it's the perfect sheer cherry red. It applies perfectly, and it's not completely necessary to crack out a mirror every time you want to reapply. The colour builds easily if you wanted to put on a bit more of a pop (see below - left is one swipe, right is two!) but will only build to a medium sheer - you won't ever get full opacity. It's great for every day wearing and I wear this a lot for work. I love lipstick, but nobody I work with tends to wear make up, so I feel as though strutting in with an opaque lip would be a bit OTT (I've even mostly cut back on my usual cat eye!) but a sheer lip is perfect for me! It feels to me like a really glossy lip balm; similar feeling to the Soap & Glory Gloss Sticks, except not remotely sticky at all. Aloha has a blend of Vitamin E and Candelilla Wax, so it really does feel like a nice lip balm and leaves lips beautifully moisturised. It also has an SPF 15, so is perfect for Summer wearing! I only wish I had this sooner so that it could have accompanied me on holiday! Wear time is pretty good for a sheer lip, but it's not amazing as you'd expect. I noticed that the balm feeling did last for around an hour and a half, but the noticeable tint left after three hours so I needed to reapply at lunch time but that's no biggie. I really, really like this lipstick and I'd love to buy more from the collection (particularly Stoked!) but at £18.00 a lipstick, it's just not something I could justify again, especially because it's essentially a tinted lip balm! I think that it's just too much money for me to be able to afford to stock up on, but I do love it and wear it a lot more than most of my other lipsticks. I managed to buy mine at £15.50 from Feel Unique when they had a 15% discount site wide, but it's also in stock at Space NK. Even though I won't be rushing to buy more from the collection, I'd buy another Aloha instantly if I ever ran out! Did you pick anything up from the Endless Summer Collection? What's your favourite sheer lip shade?